Looking for a way to stand out of the crowd in trade shows, exhibitions or fairs? Here are 7 tips that guarantee visitor flood to your booth. It is a well-known fact that everything we know about marketing and sales has changed drastically over the past few years. However the increasing number of the old school fair, trade shows and exhibitions has proven that they are here to stay as one of the most prominent ways of conducting business. These are still a great way to get in touch with customers and keep up with the sector while having a great opportunity to show what you got to your target audience. 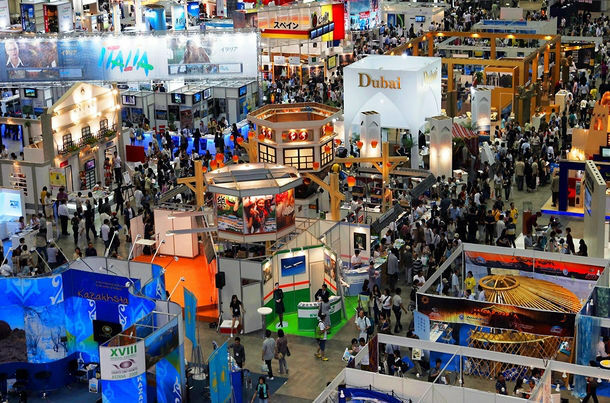 Fairs, trade shows and exhibitions may be the same in terms of the way they are being held. Besides, there are still some things that work perfectly to enlarge your audience, some things that have been in use for quite a while now. However, as technology and things it brought with itself have guaranteed their place right in the middle of our lives, these events now also have their own tactics and tips to be used to gather the attention of more visitors. In other words, fairs and tradeshows are still our long-known friends but they have changed their needs. This competitive area where you find your company or business compared to the others in the same sector demands these up to date ways to cope with the game and stand out in the crowd. These things are not impossible to achieve. Some of them are actually small yet vital features that can be added to your exhibition booth with ease. There is only one thing you should do after reading these steps and applying these in your next fair, trade show or exhibition; being ready to handle all the attention you’ll receive from the hundreds of visitors. The appearance of your booth is going to make the visitors have an idea about you and your business; that is why the importance of the booth design has gained a lot of importance, almost as much as the content you provide the visitors with. In addition, it is the backbone of a good first impression and you know how the saying goes like; “You won’t have a second chance to make a first impression.” Therefore, make sure your booth reflects your business, the signage fonts are up to date and the design of it has something special which will make it not vanish among the thousands of others. This is one of the oldest elements of a successful tradeshow experience and it hasn’t lost a bit from its importance. New methods and technologies are welcomed and appreciated by most of the visitors however face to face interaction is still valued. If your budget lets you, make sure to have a hook candidate (the person who attracts people to your booth) and a spotter (the person who approaches to the people and invites them to your stand). If not, you can just make sure your team is consisted of people who know why you are there, what your aim is and how to make the business target become real. Who says workshops and seminars are only for congresses or conferences? There used to be a time when workshops and seminars were only used during academic congresses or conferences. Not anymore. These two are a great way to engage visitors in your product or business. Analyze what they need in prior to your exhibition day, plan your workshop and make sure the visitors know about it. Remember, most of the people are there not only for products or business solutions; they are also there for answers. What is more, crowd gathers crowd; once you start your workshop or seminar with 10 or 12 people, it is likely that you are going to finish it with a lot more. Now that is a widely accepted fact: visitors like face to face interaction but they have a tendency to be influenced by visual elements more. It is also advantageous to include visualizations to some extend because you or your staff may not be able to talk to every visitor throughout the day. To be more clear, if you think you may not have the chance to offer a leaflet to a passerby, the video installed to your booth and saying the visitor, “Don’t forget to have look at our leaflet!” can do that on behalf of you. Broadcast what you are doing! And do that by social media. You can use Facebook or Twitter to do that. Your event will probably have a hashtag and the users are going to use that to explore what is happening on site. Be a part of it by live tweeting or updating your Facebook status a couple of times. You can let the users know about your location in the exhibition area or the upcoming things that will take place in your booth. This doesn’t necessarily mean you should let every visitor to refresh themselves with a drink before they continue their way in the maze of exhibition booths. However offering them some fresh coffee or tea is a good treat and it is not something they can find in any booth they stop by. In addition, coffee is proven to be alerting the pleasure receptors and you can use this cup of magic’s hotness to use your time to engage with your potential customer. Giveaways are the indispensable part of the fair and tradeshow industry. With all the technical and social approaches being changed, the promotional items have also faced a shift in terms of their usability. Forget about the files and note pads (if you are not in stationary business, of course), go for something people can actually make use of, both during the exhibition and afterwards. It is not uncommon for unique giveaways become viral during the exhibition. You booth may be visited by a large number of people who stopped by for those and you can turn this into a massive business success.